Building No.105, better know as the "Red Barn," documents the humble origins of what is today the world's largest airplane manufacturer. In 1910, 28-year-old William Boeing purchased this balloon frame building, built one year earlier, to house construction of the yacht he was having built for himself. 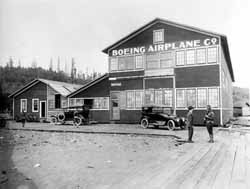 Boeing's interests shifted from the sea to the air in 1916, and his fledgling Pacific Aero Products Company converted the Red Barn into its engineering offices and manufacturing plant. The construction of its first plane, the 1916 Boeing and Westervelt (B&W) aircraft, reflected the building's first use: it was assembled by a team of carpenters, cabinetmakers, seamstresses and shipwrights. Soon after the B&W, the company produced the B-1, which became the first plane to carry international mail. The firm also changed its name to the Boeing Airplane Company in 1917 after completing a large military contract to construct 50 Navy training aircraft. However, they struggled financially throughout the 1920s and 1930s. In 1935, new federal laws prohibited airmail contractors from associating with aircraft manufacturing firms, but instead of choosing which business to pursue, Boeing sold all of his stock and left the airplane business altogether. The company later secured its future, when engineers working in the Red Barn designed the famous B-17 and B-29 bombers that helped the U.S. military win World War II. The Boeing Company quickly outgrew the open bay on the ground floor of the Red Barn and expanded to form a vital industry in the Pacific Northwest. Boeing sold Building No. 105 to the Port of Seattle in 1970. The simple two-story, gable roofed barn was restored and reopened as the Museum of Flight in 1983. The Boeing Airplane Company Building No. 105 was moved from its original position in the 1970s, and is now located south of Seattle in the city of Tukwila, in the 9400 block of E. Marginal Way South, on the grounds of the Museum of Flight. The Museum of Flight is open daily from 10:00am to 5:00pm, and 10:00am to 9:00pm on Thursdays; closed on Thanksgiving and Christmas. There is a charge for admission. Call 206-764-5700 or visit the musem's website for further information.